Kuhn Rikon 3344 7.4-Quart Stainless Steel looks quite sleek, and it would fit right in with your other stainless steel cookware. Not only does it cook your food in record time (30 minutes to an hour for hard meats), but the nutrients in the food also remain intact when you’re cooking. Unlike older models which can cause steam burns when opened at the wrong time, because it’s fast, convenient and safe to use. In addition, it also has many other interesting features. Read on and find out why the Kuhn Rikon 3344 7.4-Quart Stainless-Steel is a worthy investment that can save you tons of time and money! Like most pressure cookers, the Kuhn Rikon 3344 7.4-Quart Stainless Steel allows you to cook food more effectively. It uses pressure and heat to break down hard food into softer chunks. 18/10 stainless steel material: Unlike aluminum, stainless steel is very durable and does not rust easily that it ensures product longevity. It does not corrode or chip off and mix with the food you are cooking. It gives a lustrous shine that gives the product an elegant look. Automatic lid-locking system: Aside from the other features, this here makes the product highly safe as this prevents the lead from opening while the cooking is in pressure. Visual pressure indicator: This makes you become aware of the pressure that is happening inside the cooker. Duromatic made: An assurance of safety is further boasted by this product as its developer holds the title of being the worldwide standard of safety. It has a spring-loaded primary valve that rises as the pressure in the cooking pot increases. It has a stem atop the pot with two red line markings. The first line represents a pressure of 8 pounds per square inch, and the second one represents 15 pounds per square inch. It has a secondary spring-loaded valve if in case the first valve is blocked with food particles. The Kuhn Rikon 3344 7.4-Quart Stainless Steel has a gasket, which allows the steam to escape in a downward motion through the six flanges in the lid. This prevents the steam from blowing directly into your face. The last safety level is the automatic locking mechanism in the lid to keep it secure before pressure build up within the pot. The lid is kept locked tight while you’re cooking, and it remains locked as you’re releasing pressure. The natural release, where you take the pot off the heat to let it cool naturally. The third method is by pressing the stem of the pressure indicator so that it would release the pressure. If no more steam comes out, that means there is no more pressure in the pot. However, you must protect your hands with thick gloves while you’re doing this as the steam is hot enough to scald you. Easy to clean: Because the valve is self-cleaning. However, there may be times when food particles will get stuck in the valve, so you would need to disassemble it to clean it. The gasket must also be removed from the lid and cleaned with warm water. Don’t store it in the lid as it would stretch the material. You may use Kuhn Rikon Stainless Steel on any type of stove such as electric, gas, ceramic or induction. The five safety features almost guarantee that you will never be burned by runaway pressure. With two valves, safety holes, a gasket and a locking mechanism, you’re sure to remain burn-free as you pressure cook your favorite meals. You have three options when it comes to releasing the pressure: by gradual cooling, by using cold water, and by using the stem of the pressure indicator. It’s made of stainless steel, so you know it’s durable. However, it has a thermal aluminum bottom where a sheet of aluminum is placed between two sheets of stainless steel. This ensures you get even heating throughout the pan, but your pressure cooker remains impervious to stains. You can use it on almost all types of stoves. The valve is self-cleaning, so there’s no need to disassemble it every time you use this pressure cooker. You have to take care of the gasket by storing it in the pan, and not wrapped around the lid. This helps keep it elastic. It can be used for canning, but only for 4 pint jars. The Kuhn Rikon 3344 7.4-Quart Stainless Steel is recommended for personal home use, and no for canning huge batches of food. The Kuhn Rikon 3344 7.4-Quart Stainless Steel is a product that you will not regret spending for. Its durability is something to reckon as worth of the every cent you spend. This is a pressure cooker that will last not only for one or two years but for a very long time, even a lifetime if taken cared of properly. If you’re looking for a best pressure cooker to use at home, then the Kuhn Rikon 3344 7.4-Quart Stainless Steel is the perfect choice. 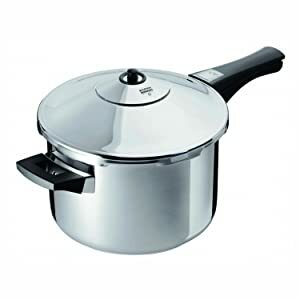 Its sleek design and easy to store pot makes it a top choice for pressure cooking. Its features are of topmost relevance that will make your cooking convenient, easy and fast. Can it be used on an induction cooktop? Yes, it can be. This will work just perfectly with it; and since the cooktop has a timer, cooking can really become way much easier with it. With a cooktop, you will have the luxury to use your time to rest as you can set the time for cooking and you will no longer be going back to the kitchen to turn off the stove. Can it be placed in a dishwasher? There is no specific function about this but you better not put it there and just clean it on the sink instead. Anyway the material is very easy to clean even with only the use of a dishwashing liquid. The size might be good for canning but that is not, so far, promoted to be used for this product.